Optional Thread: NPT, BSPT (R/RC), BSPP (G), etc. Features: Simple structure, various of connections, high quality with competitive price under factory direct sales. 8mm Big Body Hose Coupling Nitto Type Quick Coupler Socket B-20SH is with 8mm hose Barb. , Our factory is located in Cixi, Ningbo. Nearby Ningbo port, the second largest port in China, convenient transportation and low cost, and close to Shanghai, convenient for customers to visit our factory. We welcome all domestic and international customers to establish business ties with us and create a prosperous tomorrow together.non of them are bought from other companies , this can ensure to control the quality of the item . Each part of the B-20SH Quick Coupler Socket is made by cold heading machines by ourselves ,All the size are strictly standard during production. B-20SH can be used widely in pneumatic components , the Max working Pressure is 150 PSI with working temperature between -20℃ to 107℃ . When working the Air flow can reach 35 SCFM at 100 PSIG inlet with 10 PSIG pressure drop. Looking for ideal Quick Coupler Socket Manufacturer & supplier ? We have a wide selection at great prices to help you get creative. 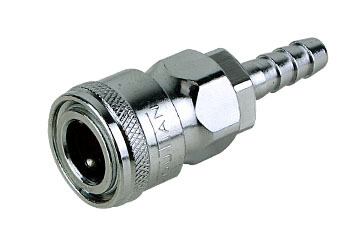 All the Big Body Hose Barb Socket are quality guaranteed. We are China Origin Factory of Nitto Type Barb Big Body Socket. If you have any question, please feel free to contact us.